A VICIOUS Game of CAT & THE MOUSE your Family will LOVE! I am a strong believer of the saying, “A family that plays together, STAYS together!” Quality time with your kids is so important on so many levels! There are only a few games that I actually enjoy and love playing with my boys. Most games we play with our boys I find it difficult to let them play at their own pace, and their own understanding. I find myself biting my tongue a lot. This game however, is hilarious and so fun to play with your kids! It is simple, fast, and can get a little intense! We even had my 2 year old join in which was adorable! The best part is it is free! You probably have everything you need in your home to set this game up! 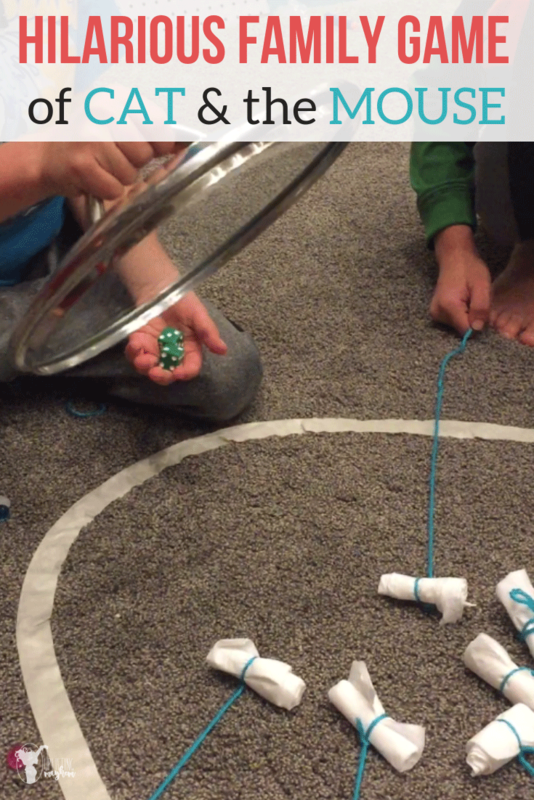 STEP #1 – Get a tissue for each player and fold and roll it up. This tissue is now called “the mouse”. 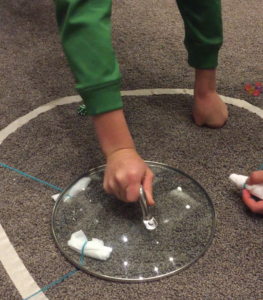 Step #3 – Tape a circle on a carpeted floor. 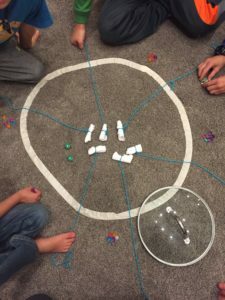 With colored tape, create a circle on carpeted floor. It needs to be bigger than a large kitchen pan lid. Each player needs 5 pieces of something. We used water beads that my boys have been going crazy over the past couple days. You can use pennies, legos, pretend money Etc. Step #5 – Get your dice and 1 large pot lid. Have each player place their “MOUSE” inside of the circle on the floor, holding the opposite end outside of the circle. 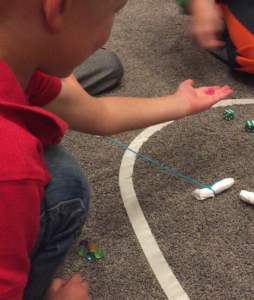 Start with one person holding the “CAT” in one hand and 2 dice in the other. The person with the “CAT” and 2 dice begins rolling. If they get doubles the “Cat” tries to catch as many mice as they can by slamming down the lid into the circle (I couldn’t think of another word besides slamming, its a controlled slam). As soon as doubles are rolled, everyone must pull out their mice as fast as they can to prevent being caught under the lid. If your mouse gets caught under the lid, you must “pay” the cat with one of your tokens. After doubles are rolled, you pass the 2 dice and lid to the person to your left. Repeat until doubles are rolled. Try and catch some mice as fast as you can. If you catch 3 mice, you get 3 tokens; 2 mice, you get 2 tokens Etc. Roll the dice so everyone can see them. If you run out of tokens, you are out of the game. 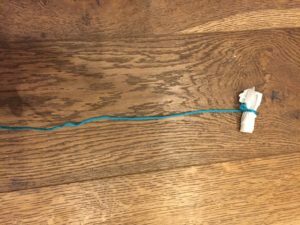 The “Cat” can fake attacking the mice. If the mice pull out of the circle, they owe the “Cat” a token. If the “Cat” touches the floor on attack when doubles were not rolled, the “Cat” owes a token to all of the mice. Hold the “Cat” in one hand ready to attack once your other hand rolls doubles. The “Cat” cannot hover close to the circle. They need to remain outside the circle airspace. (Unless you have little kids playing, then they can be wherever they want). 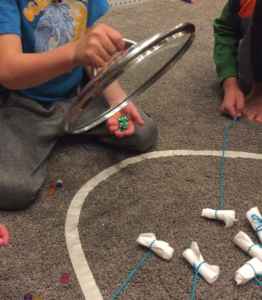 This is a game I thoroughly enjoy playing with my kids! They absolutely love it!! I hope your family loves it as well! !